‘Tis the season to give back, and at SiteLock we are extremely passionate about giving back to the communities where we live and work. We are especially dedicated to supporting STEM (Science, Technology, Engineering and Math) programs for schools in need, and helping to inspire the next generation of technology innovators and pioneers! According to the U.S. Department of Commerce, in the last decade employment in STEM jobs has grown 24.4%, making it vital that children in school today have access to the necessary tools to keep up with and continue growth in this field. However, most states provide less support per student for elementary and secondary schools than before the Great Recession. 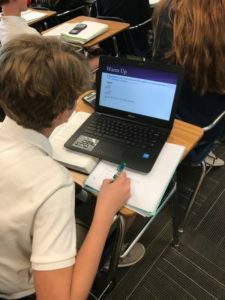 In an effort to bring continued awareness to this ongoing issue, SiteLock established a Digital Kids Fund in 2015 to help fund technology-based projects at local schools in Arizona. For every SiteLock product purchased by WordPress customers, SiteLock donates $1 to the fund. In 2016, SiteLock partnered with DonorsChoose.org, an organization that makes it easy for anyone to help a classroom in need, to fund STEM-related projects in schools in the Phoenix, Arizona and Jacksonville, Florida areas. Through their donation, SiteLock was able to support 198 projects benefitting 19,992 students at 141 schools. This year, SiteLock has once again joined forces with DonorsChoose.org to fund STEM projects for schools in the Phoenix and Jacksonville areas. To help drive additional advocacy and internal support, SiteLock is allocating additional funds to employees so they can individually choose a STEM-related project to fund. At SiteLock we are reminded every day of the importance technology plays in our lives and work. Unfortunately, kids go to school every day without the necessary tools to be successful. Through our partnership with DonorsChoose.org and the Digital Kids Fund, we are excited to play our part in helping inspire the next generation of technology experts in our local communities. As we enter the season of giving, here are some ways you can help too! $1 of the purchase price from the sale of every SiteLock product purchased by WordPress customers from 10/1/17-10/1/18 will be donated to the fund* to support classroom projects on DonorsChoose.org. *Up to $50,000 annually. This contribution is not tax deductible by purchasers and sales must be made through SiteLock.com or a SiteLock representative. WordPress plugins allow users to completely customize their website features and experience for visitors, and also serve as a mainstay of the WordPress experience. It’s safe to say that without them, WordPress wouldn’t have grown to power over 28% of the internet. 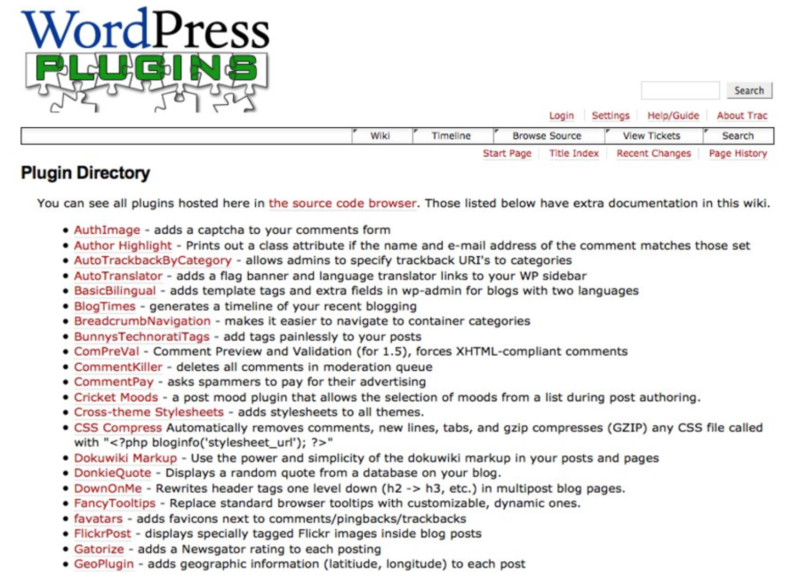 But did you know that WordPress used to exist without plugins? In this post, I’ll give you a short history of when and why plugins came to be and what the future holds for WordPress because of them. SiteLock is excited to announce the publication of its first quarterly website security report, The SiteLock Website Security Insider Q2 2017! 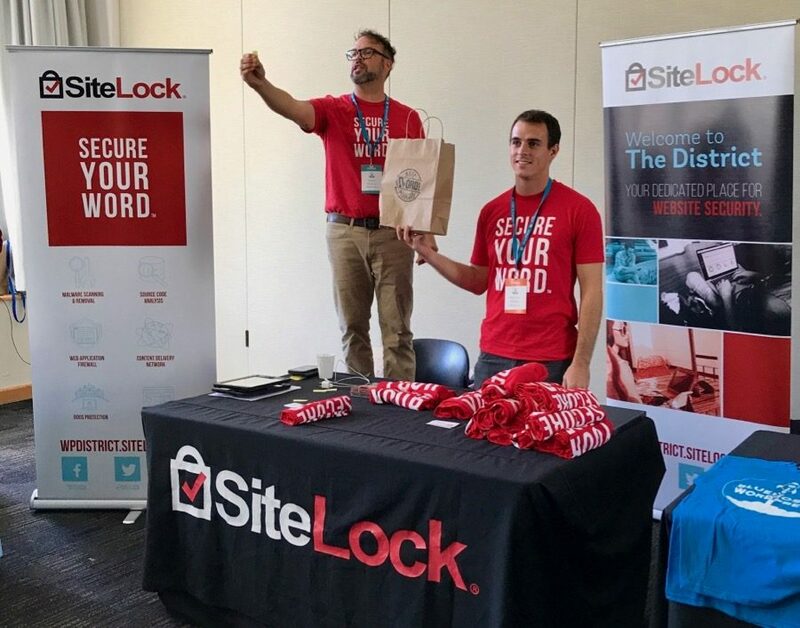 The SiteLock team recently traveled to Oregon for WordCamp Portland where we had a sponsor table and met many (if not most) of the attendees. It was a busy camp morning for me because I also presented a session titled “5 Steps to Personal and Website Security“. 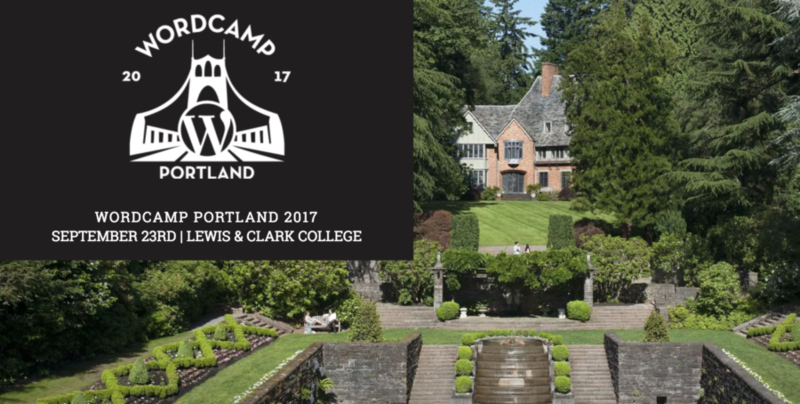 I’m happy to report that my session was received very well among the WordCampers. First and foremost, I want to give a shout-out to the #WCPDX organizers. They did an excellent job ensuring the sponsor tables were placed in a room that received steady traffic. The tables were set up between the session rooms, also conveniently located next to the coffee, water, and other refreshments. As with most WordCamps, the session topics were relevant to all types of WordPress users, and the session times were 35 minutes, plus 10 minutes at the end for Q&A. However, there were also lightning talks of 10-15 minutes, which were informative and entertaining. Ethan Clevenger’s lightning talk discussed how to succeed as a freelancer, and in particular, the reasoning behind raising your prices and how to avoid the fear of making less money. 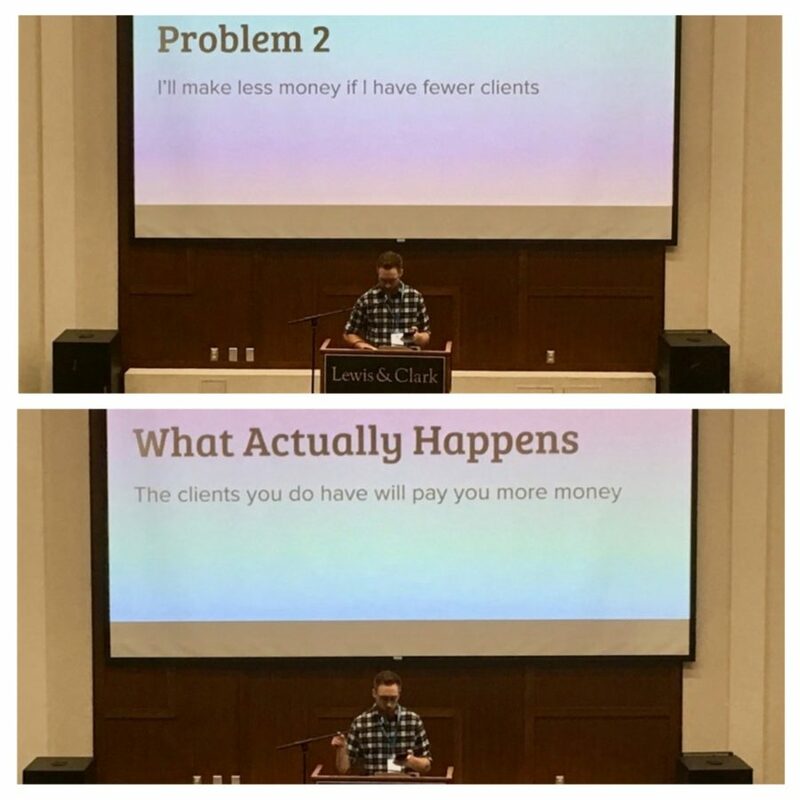 Not only did his talk give valid advice on increasing your revenue while reducing your need to “constantly chase new clients,” but Ethan was also pretty hilarious in the delivery of his content. In Praise of the Side Project: Learn New Skills, Make Money, and Have Fun. Rachel Cherry is a Senior Software Engineer at The Walt Disney Company and delivered a unique and inspiring talk to those in attendance. She showed proof that side projects can lead to bigger things like Apple, Twitter, and even Gmail. The point she made though, was that they don’t always have to, sometimes side projects can simply be for testing the waters. This could include learning a new software package, drafting a blog about your favorite food to improve your writing skills, or building websites to razz your friends (#hiroy). Judging by the comments after, her talk made those in attendance feel at ease and less worried about their half-done projects. Andrew Taylor’s talk about automation was great. Specifically, automating as much of your daily workflow as possible in order to put processes in place that you can rely on. This also allows you to be more productive. 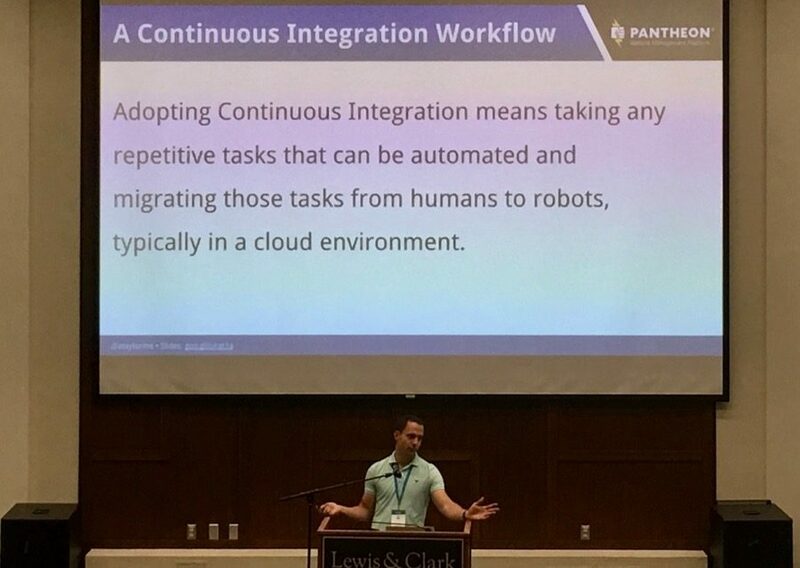 Even though it was a lightning talk, he packed in both the philosophy behind continuous integration and some actual methods he uses in his day-to-day routine. 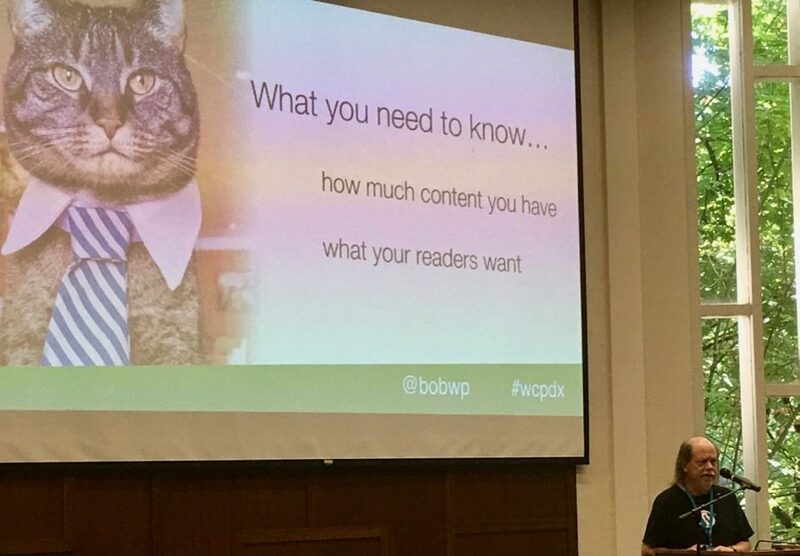 Bob Dunn, more commonly known as BobWP online, delivered a great talk on why and how to repurpose any content you’ve created. He’s been blogging for ten years and produces three successful podcasts. How does he do it? You guessed it, repurposing content in order to save time and meet the needs of his different audiences. We always try to do something a little special at WordCamps, in addition to giving out webcam covers and t-shirts. In Portland, we raffled off an Amazon gift card, which was a fun experience. When reading the winning ticket numbers, we had to go through A LOT of them before we finally had a winner. It actually turned out to be pretty entertaining and helped build anticipation. 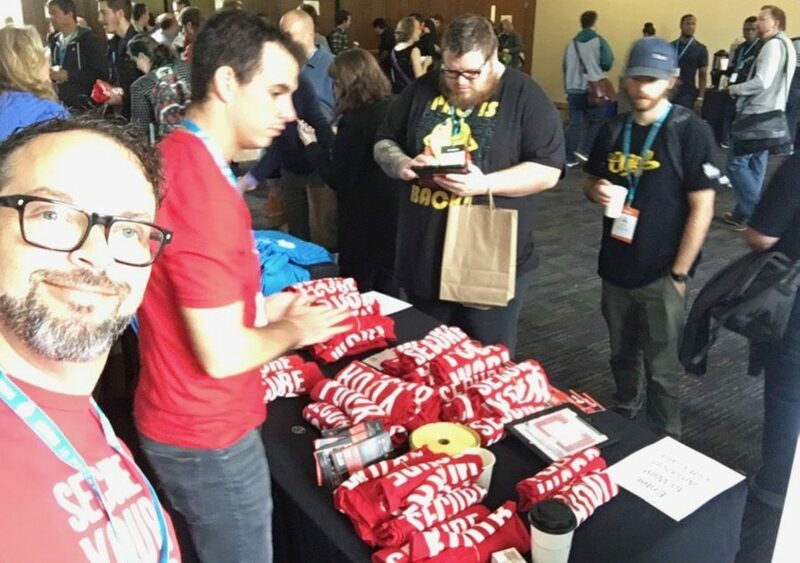 By all accounts, WordCamp Portland was a great event and one I know we’ll be back to next year. If you weren’t able to attend and you’d like to know more about SiteLock, I encourage you to read more about our company and products, like malware scanning and auto-removal, as well as our web application firewall options. We are excited to announce that SiteLock®INFINITY™ was recently recognized as a winner of the 2017 Cloud Computing Excellence Awards by TMC’s Cloud Computing Magazine. The Cloud Computing Excellence Awards recognize companies and products that most effectively deliver network security through cloud platforms and provide security for cloud based applications. INFINITY is a state of the art malware and vulnerability remediation service featuring unique, patent-pending technology. INFINITY combines deep website scanning and automatic malware removal with unrivaled accuracy and frequency. Designed to scan a website from the end-user’s point of view, it catches any trace of malware before the user does. Websites experience 22 attacks per day on average. That’s more than 8,000 attacks per year, per website, according to recent SiteLock data. SiteLock INFINITY provides always-on, continuous scanning to detect vulnerabilities and automatically remove malware the moment it hits. Once the initial site scan is complete, it scans again to ensure constant surveillance and protection with the highest degree of reliability. Since 2008, we’ve remained dedicated to “protecting every website on the internet,” and SiteLock INFINITY helps us deliver on this mission. Thank you to TMC’s Cloud Computing Magazine for honoring SiteLock INFINITY with a 2017 Cloud Computing Excellence Award! Hyannis Whale Watcher Cruises is dedicated to providing ‘Cape Cod’s Finest Whale Watching!’ Established in 1989, the company brings more than thirty years of experience to whale watching, with an impressive sighting rate of 99 percent. As the company’s popularity grew, its website was forced to expand from an initial online brochure to a comprehensive resource including whale watching information, trip scheduling and online ticket purchasing. These changes also greatly increased customer reach both nationally and internationally.